Coupled with biomechanical data, organic geochemistry and cladistic analyses utilizing abundant genetic data, scientific studies are revealing new facets of how plants have evolved over time. This collection of papers examines these early stages of plant physiology evolution by describing the initial physiological adaptations necessary for survival as upright structures in a dry, terrestrial environment. 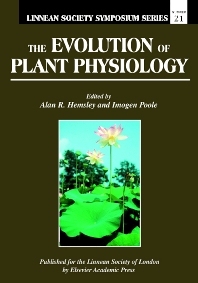 The Evolution of Plant Physiology also encompasses physiology in its broadest sense to include biochemistry, histology, mechanics, development, growth, reproduction and with an emphasis on the interplay between physiology, development and plant evolution. Focus on how evolution shaped photosynthesis, respiration, reproduction and metabolism. 5 Did Auxin Play a Crucial Role in the Evolution of Novel Body Plans during the Late Silurian–Early Devonian Radiation of Land Plants? 8 Structural Biomacromolecules in Plants: What Can be Learnt from the Fossil Record?